Kays Kids: Some times Granny gets forgetful. Some times Granny gets forgetful. We have had this monster in our house for 4 days. It is all because of some one who remains nameless that lives in this house. 4. It is very, very windy. 5. It has to go all night and day. Well because it is windy and has to blow all day and night, is it a clothes dryer?..... no no... That is not it. Some one who remains nameless left a tap on. When taps are left on and the plug is in the sink, the water does not know where to go, so it decided to go on the floor. Well have you heard of the word flood? Have you seen a swimming pool in a kitchen? Well that is what happened. The nice insurance man came out and left us Blue Bertha who has a bad case of wind!!!! Talk about rubber boots and towel and mops. At least the floor is clean. Granny has a bad case of the guilt's. If you come to our house and want to stay the night you will have to sleep under all the saucepans and bowls, because they are all on the spare bed. I really need Toast with peanut butter and honey for supper tonight . With lots of warm milk. I will see you all next week when I hope we haven't blown away. Welcome to all our friends. 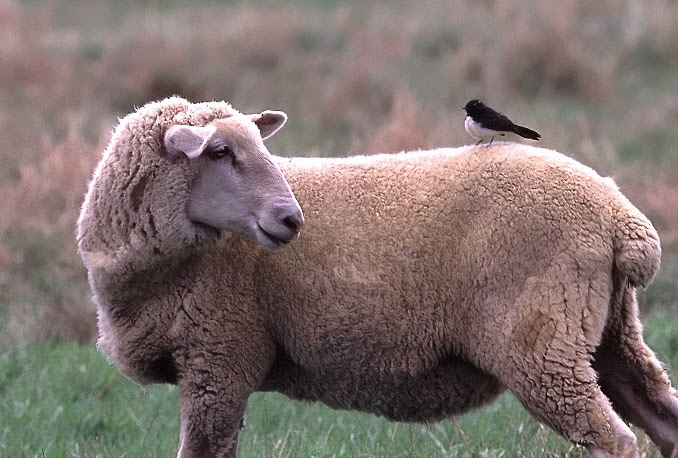 We wanted to show you a little Willy Wag Tail riding on the sheep's back. We saw this very, very regularly when we lived on the farm. They would pick the seed out of the wool. "Getting up early is simply mind over mattress." Wilbur......there will be a day.....that you...well...ehh.....will be "older" too.....and might start to "forget" things......so don't be angry at Granny.....and give her your biggest smile because you know what Wilbur??? "a smile tells everything!" Now, when the heat comes back you can lay in front of the big blue thing......all your hairs will go backwards but...it is cool! OK, cool, just like you! Have some more peanutbutter Wilbur, you deserve it! Oh my mohair, is the roof leaking? Poor Granny, that must have been a mess to clean up. Make sure you help as much as you can. Oh no....sorry to hear about the flood. Yes, it is true Wilbur, we all make mistakes. Hopefully, you will be back to normal soon. Wilbur, please do us a favour and give that special someone who remains nameless a very big hug in our name... this someone deserves it after all this mess. We're awfully sorry about this desaster... but maybe this will comfort you - in your case it was clear water. Here in Europe we're having terrible floods with people losing everything, sometimes even their lives. So here's to Blue Bertha for making your home dry and cozy again... and you should better get yourself an extra portion of honey toast - you deserve it after all this trouble. Hi, Wilbur and Kay !!! a big hug from France !!! and hope your house is more quiet today !!!! What a mess indeed... So sorry for that! We know what it means to have to mop up water, water and more water. We had that last year in the basement in February and later in the summer. For that Pieter did all those water projects and we're safe now! Hope the damage will not be too bad and in a week's time things will look better again. Loved your quote about mind over mattress! Poor you and poor Granny. We hope you soon dry out. It sounds a bit like our house at the moment. Alan and Ann decided to get nice new flooring downstairs and all the bears had to move out 'cos all the furniture got taken out of downstairs and there was nowhere for us all to sit. Most bears are sitting on a spare bed, so we're glad the saucepans aren't there too. There was a very nice man who worked and worked for eight whole days to put the floor down and then the skirting boards had to be painted, and not everything is back in place yet and every bear is still displaced. It's a bit discombobulating so we can imagine how hard it has been for you as well. Dear, dear Wilbur! I KNEW it!!!!! You are not only gold at the outside.....your inside is GOLD too! btw Wilbur.....did you find out already you can have a lot of fun with the blue Bertha?!!!! try to eat a sandwich with pieces of chocolate in front of Bertha!!!! Throw a handful pieces of paper in the air in front of Bertha! Add on a moustache.....and stand in front of blue Bertha! Enjoy and DON'T tell Granny I gave you these tips! Wat vreselijk Kay, het is te hopen dat alles weer goed zal drogen en dat de houten vloer niet krom gaat staan. Oh no! so sorry to hear that you had a flood and think we have all done that. I hope blue Bertha gets things sorted and good as new. I hope you have survived this difficult time soon. I know how it is to have water in the house since the great flood last year. An entire floor of my house was broken and full of muddy water. All the furniture, all appliances such as washing machine and freezer. It has been almost six months lasted until all the floors and walls were reasonably clean and dry again ... and to this day I struggle now mold here. I wish you strong nerves! Hang in there! Oh my! I'm sorry you and Granny are dealing with having an outdoor swimming pool indoors. Not nice at all. Hope the Blue Machine isn't in residence too much longer. Eeek, we're glad you didn't all float away! Mi dispiace sapere che avete avuto dei danni a causa dell'alluvione, spero che non sia nulla di grave e che presto passi tutto. Oh Wilbur - Your thought for the day got me giggling sooo! Gonna have to copy that one down. You BraveMost Bear - what a Travail! We knew exactly what that blue machine is coz actually your granny did WaaaY better than PaPa K here - he merely spent 5 or so days coming up from the basement casually saying "Don't worry about the basement its OK" - Finally I got curious and OMG Flood…. Turns out he had been mopping it out and it all kept coming back coz it was the Water Heater NoT the foundation! (which actually was very lucky) MaMa K flipped out and got the Giant Yellow Blower and Much bigger mops and soon we had it all worked out but WheW! What a story Wilbur! I am so sorry about your troubles!. I have been through a house flood before and it is not at all fun! We never had a blue machine, but the large fans that were used, did make quite a wind storm.